The amazing giveaways continue here at Sleepopolis during Latex Mattress Week! Today we announce your chance to win a FREE mattress from Latex for Less. Now some of you might want to know what this mattress is all about before you throw your hat in the ring. Well you’re in luck because I have done a full review of the Latex for Less and found this flippable mattress constructed using bost Dunlop and Talalay latex to be a quality bed, especially great for those looking for a mattress that sleeps cool. This mattress made my list of Best Latex Mattresses and if you’re interested in latex beds you will definitely want to check it out. Now stop wasting time and enter the giveaway for your chance at a new bed! If you’re just catching up with Latex Mattress Week be sure to enter into our ongoing giveaways as well! I like the Sleep EZ Roma for value, but I’d love to win this one. Out of the best latex mattresses you reviewed, my favorite is the Spindle mattress. And that’s because I really like how adjustable it is and how the mattress basically allows you to find your ideal firmness level, which would be perfect for me since I’m not sure what firmness level I would like right out of the box. Thanks for the fantastic opportunity to win! My favorite is the Zenhaven! ZENHAVEN seems like an awesome mattress & it’s my favorite. I love the fact that it’s flippable. I would love to win, I desperately need a new mattress but it’s just not in my budget right now. I would LOVE a softer mattress that’s cooling so I guess I’d say the Dunlap, I need a new mattress so bad so I appreciate it!! They are all wonderful. Maybe the Leesa.Or the Ghostbed. Too hard to choose just one. My back would love this mattress. I’m so ready for a new bed it isn’t even funny! I’m in! While I like the fact that this mattress is built entirely of all-natural materials, it looks too soft for me. But I think my husband will like Latex for Less. I am praying to have the opportunity to experience such an amazing company’s product . I see that you all have placed your hearts and minds into helping others sleep well and have a well put together mattress. I have literally entered every contest . Thank you for the opportunity ! A bed that sleeps cool sounds amazing. Our bed gets very hot. We like the warm weather, but in the summer it can be unbearable in the triple digits. So hard to choose because they all sound like I need them. Sooooo the Leesa. I’m a side sleeper so the Zenhaven sounds the best, but I also think the Latex for Less mattress sounds great too. Latex for Less Flip-able is my choice. Looks great!!!! I cant wait to try it out!! The ghostbed mattress along side the Zenhaven! I like the Latex for Less mattress, although all reviewed sound like great mattresses. I’m sleeping on a Puffy Mattress so any of these would be a nice change. Latex can be expensive, this is reasonable. I can’t decide which mattress is my favorite! Each time I read a review, I think THAT mattress is my favorite. LOL What I like about this one is that it allows you to sleep cool. My husband sleeps hot so this would be a plus!! The Ghost mattress sounds amazing! Thanks! What a great opportunity !! I slept on a latex mattress some 30 years ago and have never been more comfortable while sleeping. I am hoping to WIN THIS MATTRESS !!! The Zenhaven is my favorite mattress review and it’s good for side sleepers. Gosh, each time I read one of these reviews i’m less and less sure which latex mattress would be my favorite. I like that the Latex for Less is also flipable with a softer side. I like firm, with a very soft top layer. Can people who are allergic to latex sleep on latex mattresses? Is there enough non-latex material between them and the latex to make it possible? I think they all have great features, I have been paralyedfor years and my back is killing me, I need a new mattress . Latex for Less looks great. I’d love to try the Ghostbed. The Latex for Less mattress looks very comfy. I love that it’s organic… just learning about this! Thanks again for the great review, and helping me learn. I actually think the Zenhaven would be best for me and my wife. Of course, anything that slept cool would be good also. I burn up at night no matter the temperature in the house. I’ve never had a latex bed but I like that it’s cool. Can’t be feeling hot when I sleep. This is the perfect mattress for me. It sleeps cool is just what I am looking for in a mattress! I like the Latex for Less Mattress best. Would love to win this for my side-sleeping son! Thank you so much for this opportunity, I know many would love to win this mattress. Have a Purple 3 & so far not terribly impressed. Very comfortable but was hoping it would cure my terminal insomnia! Thanks for the reviews & chances to win! I like the Ghost Bed the best. I think I would like the Ghost Bed mattress. My favorite bed is the Zenhaven. I am a strict side sleeper. I like that the bed has good pressure relief. Great contest! Thanks for the opportunity !! This Latex For Less mattress sounds wonderful! I love that the beds are flippable. They all sound awesome and so comfy! But since I am a side sleeper most of the time the Zenhaven sounds like the one for me! My waterbed leaks and we desperately need a new mattress. I sure hope I win. No $$ for what I need. 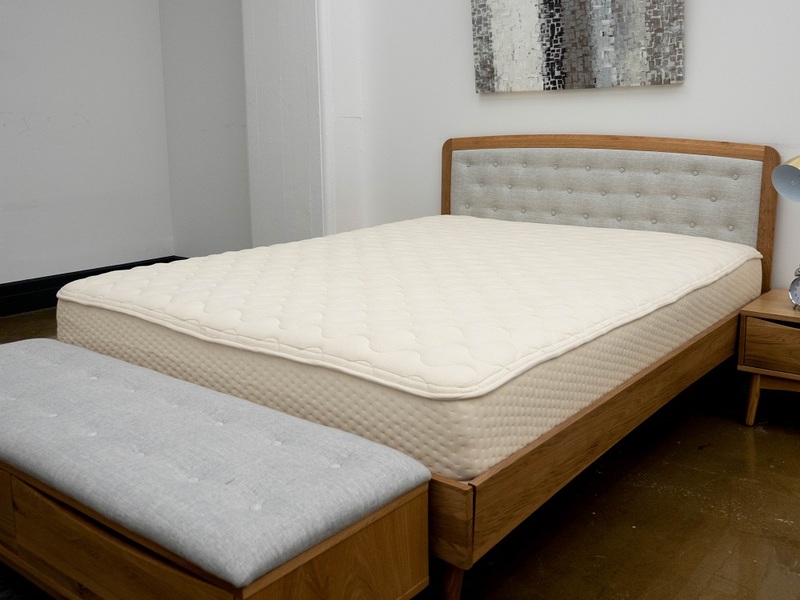 Latex for Less and found this flippable mattress constructed using bost Dunlop and Talalay latex to be a quality bed, especially great for those looking for a mattress that sleeps cool. So if you get hot or you sweat while you sleep, this would be a great mattress! The Idle, because I’m a side sleeper. The Avocado Green would be my first choice. They all sound amazing, though as a side sleeper I suppose I do lean towards Zenhaven. I really like the GhostBed latex mattress. I love the latex mattress. Wicking away moisture is such an awesome feature along with the different layers to allow for more comfort options! I sleep on a couch bed, Uncomfortable ! Would love to win a latex mattress! Love that it is organic cotton and natural wool! Ghostbed is my favorite, though I like this one too. I like that you can flip the mattress from a mid side to a firm side to see which is best for you. Always nice that it has a cool cover because latex can be hot. Seems like this one is a winner. There are a few good options in there, but still think the Avocado Green might be the best for me. I like the review of the Tempurpedic Cloud Supreme Mattress…looks like what I need as a side-sleeper. I am being drawn to the Zenhaven more and more!! I hope I win! But, I hope whoever needs one wins, really. A number of brands have piqued my interest and we are in the market to furnish 3 bedrooms now. One is the organic brand Avocado. This will meet our needs as would a couple others. I like the review of the Zenhaven mattress…good for side sleepers like me. I personally prefer a softer bed as a side sleeper so this mattress might be a good fit for what I need. The best part of all the latex offerings are the sleeping cool, would love to have that experience!